Scooby-domain (Sequence hydrophobicity predicts domains) is a method to identify globular regions in protein sequence that are suitable for structural studies. The current version is 2.0. Note however, that the JAVA applet runs version 1.0. The Scooby-domain JAVA applet (v1.0) can be used as a tool to visually identify 'foldable' regions in protein sequence. George RA, Lin K and Heringa J. (2005) Scooby-domain: prediction of globular domains in protein sequence. 2005. 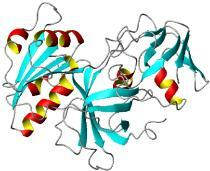 Nucleic Acids Research 33: W160-163. Pang CN, Lin K, Wouters MA, Heringa J, George RA. (2008) Identifying foldable regions in protein sequence from the hydrophobic signal. Nucleic Acids Research 36: 578-588. *Note: allowed gap symbols are "." and "-". Gap symbols in a single sequence will not be deleted. The ScoobyDo web server was developed by Richard George. Updated & maintained by Bernd Brandt.